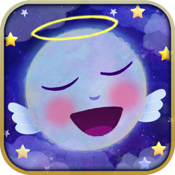 Lullaby Planet is the perfect App for your baby or toddler to relax and fall asleep to in a peaceful and soothing environment. Its delightful illustrations and reassuring music will entice even the youngest child to fall asleep. This application features 6 fully interactive scenes that encourage your kid to interact with cute and lovable characters that are ready to go to sleep. They will accompany your child on a sleepy journey to the world of dreams for a peaceful night. Everything moves peacefully and can be touched to trigger cute animations, calming songs and gentle melodies. You can choose between a soothing set of well-known lullabies, classical pieces of music (Mozart Beethoven, Brahms) and nature sounds. The lullabies have been recorded with a vibraharp to create tunes that are particularly calming. • 6 fully interactive environments and more than 100 interactive elements.